This past weekend I made what has become an annual foray to New Mexico to climb on Dakota sandstone with my old climbing partner Tom Ellis, along with his friends William Penner and Masumi Shibata. The area is loosely labeled Roy, as that’s the closest “town” to the climbing. It is comprised of the Canadian river valley and its myriad side valleys and washes. 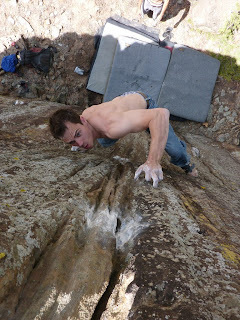 Most of the quality bouldering is generated by the top capstone breaking off and depositing boulders down the steep slopes to the bottom’s of washes. We call the super bullet brownish purple stone, merlot-stone, and this is what we look for when hiking in search of new rocks. Tom has been continually hammering me all winter about new walls, boulders, and side valleys full of bullet stone. Stories of water polished slopers in the washes, and super bad high ball walls finally incited enough jealous rage in me that I purchased a ticket to Albuquerque. I flew out on Saturday morning, and after a 3 hr drive, we were parked at the campsite, jumping out onto the grasslands, ready to dip into one of the newly found valleys. The camping is at an elevation of about 5900 ft, on the wispy plains above the boulders. A maze of barely visible two-tracks leads across the grasslands to the hidden drop offs. For the next three days we climbed all styles of rock including cool warmups, giant steep walls, 30 ft roofs, and sick vertical problems. Notable FA’s were Masumi’s addition to a giant roof, which involves progressively harder climbing out a 25 ft deep roof to a stout finish sequence on perfect incuts. William also managed to burn off the rest of us on “beautiful pig”, the center line up a majestic black boulder culminating in a mono pinch crux move to a big runnel pinch. FA’s were the norm, although the area boasts almost 600 established problems, there are still obvious dope projects at the main areas. Most of the harder lines have yet to be repeated, and are typically sandbagged with Tom’s grading system. Everything is either V2 or V9. 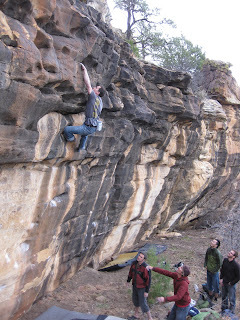 Tom, William, and Masumi all have the sandstone climbing style dialed in, and made many impressive ascents over the weekend while I struggled with flaring elbow tendonitis from all of the compression climbing. 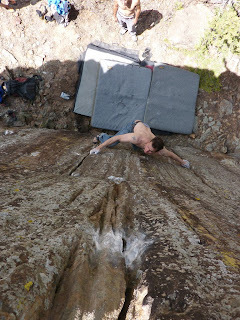 The highball wall in the pictures is called the world wide wall, WWW, and it is a BEAST of a wall. There are several amazing hard lines on it that top out, and several others that have yet to have their top outs scrubbed and sussed. The WWW is definitely the highlight of the valley we climbed in, though there are also several amazing roofs and freestanding boulders everywhere in the same area. Tom, William, and Masumi have put months of work into “nipping” the scrub oaks with clippers to create trails, and have cleaned up countless problems on tr or with the dreaded stick brush. I had an awesome time with the New Mexi dood’s, and can’t wait to go back this fall or next spring. After perusing the valleys with a binoculars, I realized Tom is right; there truly is a lifetime’s worth of sandstone in Roy.